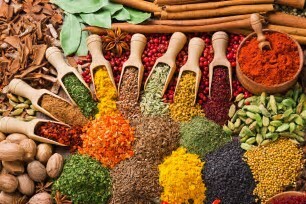 Such beautiful, natural, autumnal colours when spices are placed together on the photo I’ve chosen. I confess, I’m not a very adventurous cook. I like to try new recipes and I don’t shy away from herbs and spices if required, but mostly I’m aiming to serve nutritional, healthy food as quickly as possible. It’s that work-life balance thing that I never seem to get right. In the early 70s, dining out for me was usually at a popular Italian restaurant where I would be wary of eating anything with ‘bits’ on. Little has changed just a different Italian restaurant and I’m fine with herbs now. I no longer think that ground black pepper is the most exotic condiment and if I’m cooking Italian I add plenty of basil, oregano and marjoram. A homemade quiche always has a liberal sprinkling of tarragon. Parsley, sage, rosemary and thyme. I drove everyone mad with my rendition of ‘Scarborough Fair’ and I think they were relieved when a couple of snapped guitar strings meant I could no longer pick out the chords on the cheap ‘made for tourists’ instrument I bought from a local market in Palma Nova. I was enjoying my first trip to Majorca and musical by nature, I’d picked up on the Spanish guitar sound from the trio of players that provided evening entertainment in our hotel. I soon gave up trying to copy them and instead concentrated on ‘Scarborough Fair’ from the Simon and Garfunkel cassette that was part of my birthday present. My main present was a Sony portable cassette player, before the days of the Walkman and long before CDs. Nearly every Simon and Garfunkel song brings back memories of that first of many holidays and birthdays in Majorca; the fresh, sweet fragrance of the hotel, the tapping of my sandals on the marble effect flooring, the lights along the coast-line seen from our balcony and yes, the unfortunate episode with Bacardi and Coke as mentioned in last week’s blog. I don’t think I’m responsible for setting a trend. Majorca was becoming a popular holiday island as going abroad was easily accessible in the mid 60s. I haven’t been for decades and probably wouldn’t recognise Palma Nova or Magaluf anymore. ‘Scarborough Fair’ will always be special and I apologise to anyone who had a room close to mine at the time. That o’er the pale-tops smiled on passers-by.